SES and FRIENDSHIP launched the first state-of-the-art Maritime VSATs and launched SATMED, the first satellite based e-health platform on two of FRIENDSHIP’s floating hospital ships – Lifebuoy Friendship Hospital, Emirates Friendship Hospital and a third one is planned for Rongdhonu Friendship (formerly the Rainbow Warrior II) Hospital. SATMED was also recently rolled-out at the Friendship training centre in Gaibandha providing for enhanced training on campus. The project, which aims to improve public health in emerging and developing countries, was funded by the Luxembourg Government and implemented in cooperation with SES Techcom Services and e-Medical Communication (eMC). 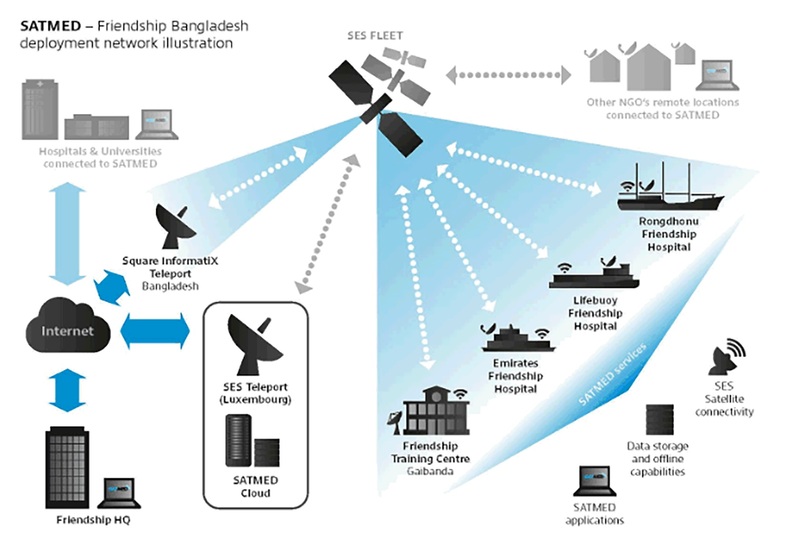 SES with the technical assistance of Square Informatix Ltd. deployed SATMED on 2 floating hospital ships; Lifebuoy Friendship Hospital, Emirates Friendship Hospital and the third one on Rongdhonu Friendship Hospital is scheduled for deployment on the 14 March.